Containment did it work or not. In my opinion containment of communism did work because it did not spread to all of Korea only north of it. So it did work one it did not spread to all of Korea and it did not spread to the U.S. Mao Zedong , the long march, the great leap forward, the cultural revolution and Tiananmen Square had a connection to the rise of communism. The long march helped the rise of communism because that allowed Mao Zedong gain to gain more power and help from other many peasant farmers. 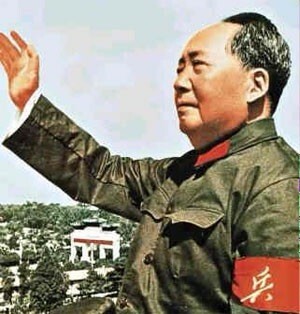 With thier help Mao Zedong lead the Chinese communist revolution after WWII. They also kicked the Nationalists Party out of China. 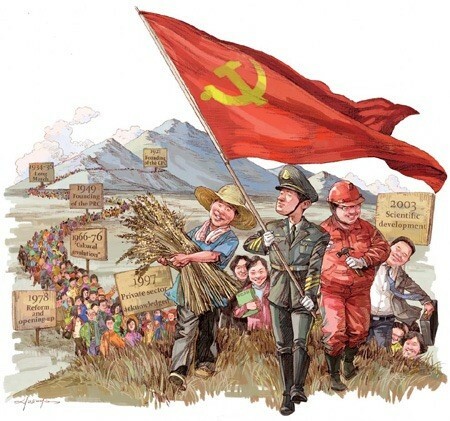 In this picture you can see some farmers Mao Zedong had the support of a communist government. Ater being pushed out of China by the Nationalist party and walked 6,ooo miles and lost 93,ooo of his men he had the support to fight back. 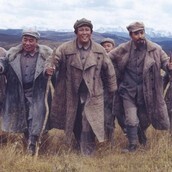 This picture shows the route of the long march. 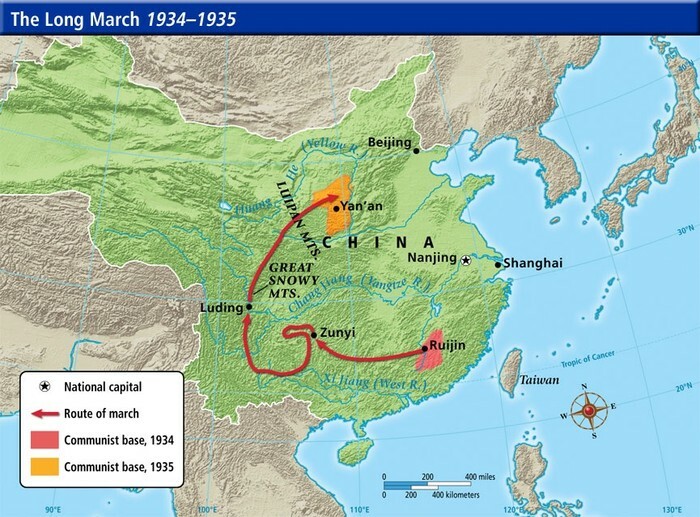 It shows the route of Mao Zedong and the communist bases. 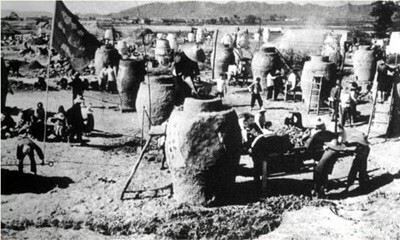 The Great Leap Forward is in impact to the rise of communism because Chinese citizens that lived in rural areas or were peasant farmers were put to produce steel and work in factories. That was a benefit to them because they had a better life and would get more money. Since those people had all this benefits for them they were in favor of communist government in China so the movement of a communist government movement began. 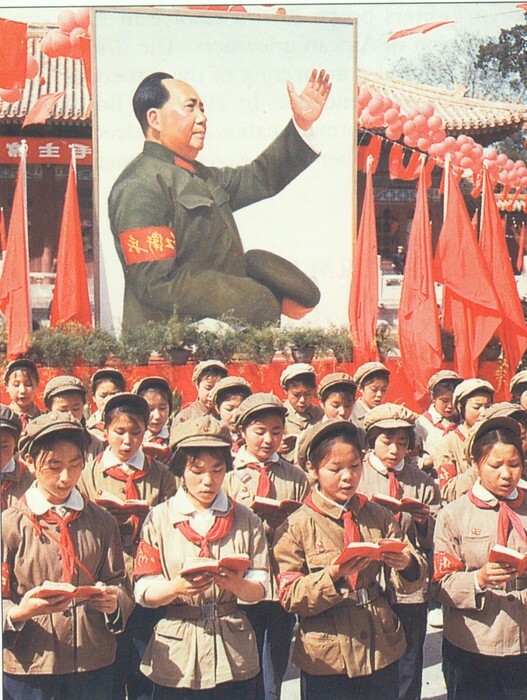 In schools in China teachers must teach from the red book. If they don't they will be punished or executed (killed). 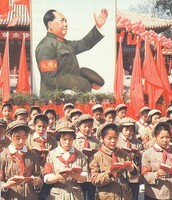 The little red book teaches and explains the communist thoughts and rules. In this picture you see a man running while he is burning alive. In China's communist government people who would not follow the rules or were seen as a threat or bad influense to those who were I favor of communist were punished if you were lucky but some did not have the same luck some were killed or badly beat or as you see burned alive. 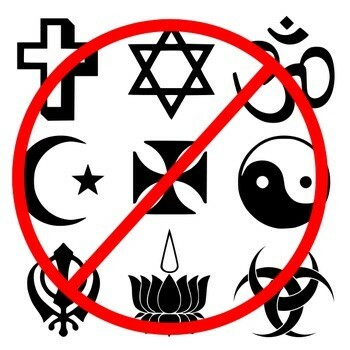 In China the communist government banned religion and some websites. They see this as a threat or bad influence to its people so they banned them. They believe that their citizens might be influenced bad and rebel against the communist government because of the websites or religion. 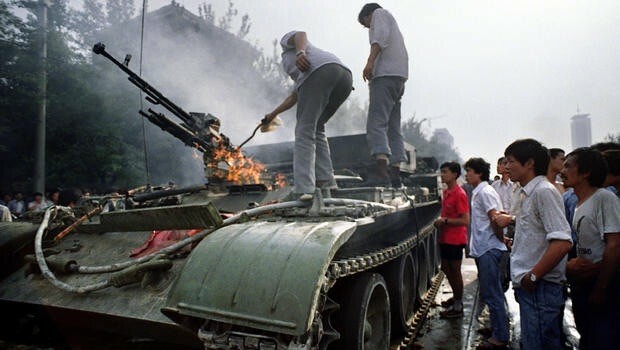 In this picture you see how protesters are vandalizing a communist part tank. 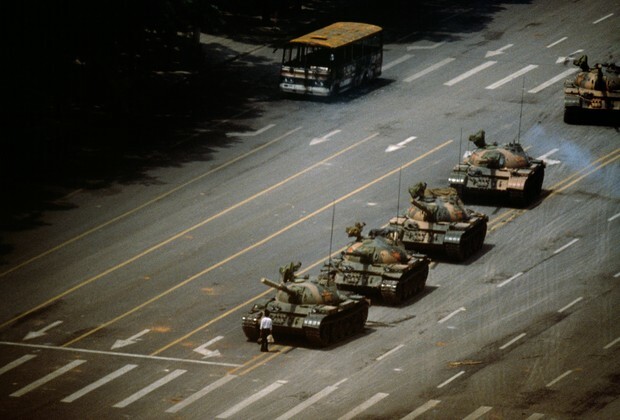 They are setting it on fire because they disagree with with the communist government rule so they protested at Tiananmen Sqaure where a big massacre happened. 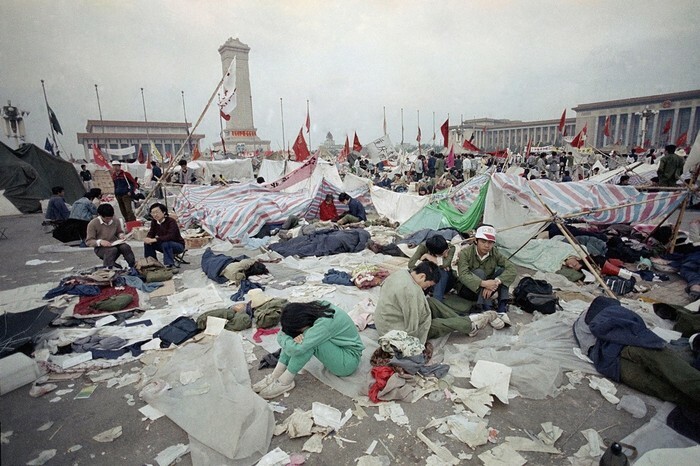 As you see in this picture you see people living in filthy areas this is because they are protesters that are protesting in Tiananmen Square. They are on strike for one reason that is because they don't want a communist government but a democratic one. 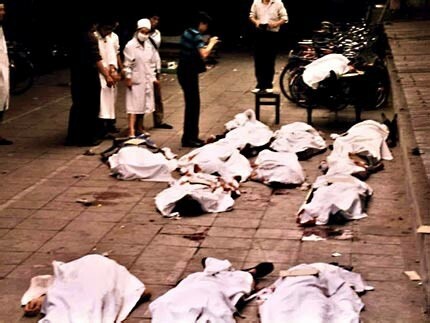 After the protests in Tiananmen Square a huge massacre happened. The red army ( communist party) came to the square and started to kill many people who believed in a democratic government and had different view points. 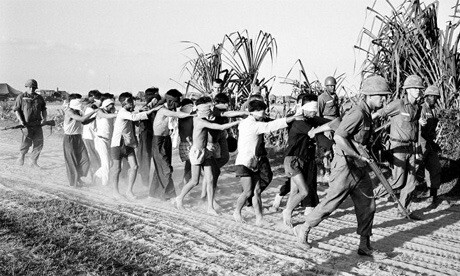 Life in Vietnam was hard during the Vietnam war that was because many attacks would happen and many people would get injured even kids as seen in the picture. If people were against the communist government they would be sent to be killed by the communist soliders or beaten to death. This is because they did not like the communist rule and disobeyed the rules. 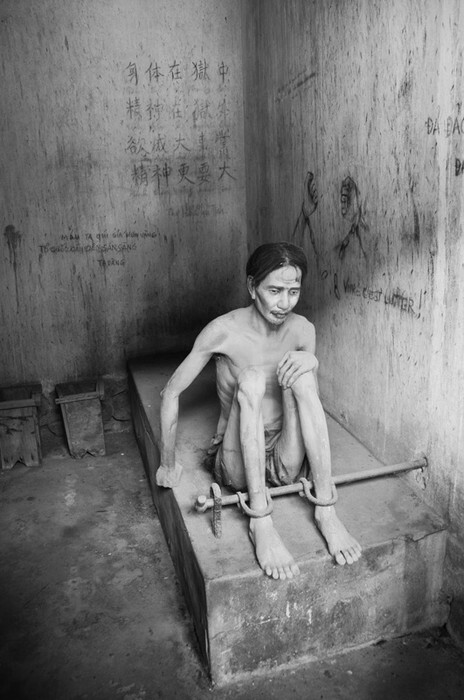 In this picture you see a person that is tied to the wall by his feet. This is a person who was against the communist government and in favor for a democratic government. 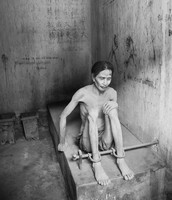 As you see these people were not feed correctly or starved for their democratic beliefs. The Vietnam war was a war to spread communism to all of Vietnam. 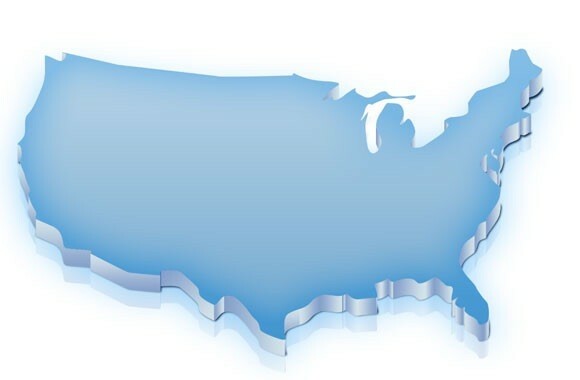 At first it was in part of vietnam because it was 2 different countries that were split at the 17th parallel but sadly it spread to all of Vietnam. The U.S hot involved to this war but their help wasn't enough to stop the spread of communism even with the most advance military equipment. 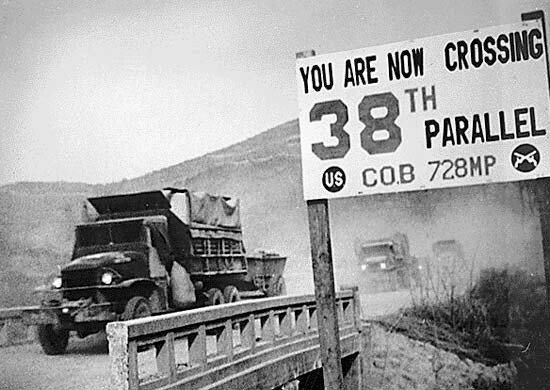 The U.S was involved in both wars the Korean war and Vietnam war. The U.S got involved in the Koran war and was helpful to South Korea because the U.S helped them get a democratic government system. But in the Vietnam war the U.S did not do as much because Vietnam became communist fully. 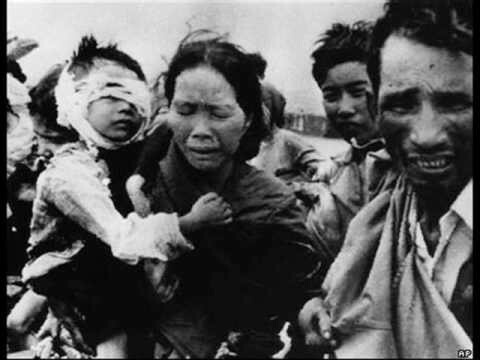 So the involvement of the U.S was helpful to South Korea but not as much help to Vietnam. In my opinion the containment of communism did work because Korea did not become fully communist. Also because when communism started there was many countries with a communist government but today in modern time there is only 5 countries with a communist government. So in my point of view the containment of communism did work.